Nice to see Sanjay in the anchor chair again. I am liking him filling in for Anderson. He is very engaging and makes you interested in whatever he's talking about. A good bit of the show was topics other than health or health care and Sanjay did a great job covering them. Hope to see him filling in for Anderson again. Anderson looks so ill in that pic with a fan. I hope he got some rest this week and will be back in the anchor chair monday nite. Good choice from the Andervault with the Simon Cowell interview form 60 Minutes. I thought 360 was excellent tonight, with a variety of interesting stories and discussions. I really enjoy the show when Sanjay substitute anchors. The tone is light and pleasant the whole hour, and I felt nice afterward, not unsettled. Thanks for the rundown, Wonz. I really did mean to watch tonight, and then life happened. The Simon Cowell interview never fails to make me smile. You can tell Anderson liked him. I watch Craig Ferguson every night, and frankly I was a bit surprised he didn't have a better AC impression. He's usually quite good at them. I guess he just needs more practice. It was funny, nonetheless. I want Sanjay Gupta as my primary care physician and the line forms behind me. Sanjay did an excellent job anchoring. I actually chose to watch him instead of Bill Maher, who proved to be rather boring this week. I used to be a fan of Jack Hanna and taped his shows with LK for my classes. No longer. He was on Ali Velchi this PM, and being snowed in here in the East, with nothing else to do, caught him being interviewed with Jane Velez Michell from HLN. He actually told her she "Didn't know what she was talking about, and shouldn't keep interrupting him." I know he is a zoologist of merit, but he seems to have a "connection" with Sea World. He believes in captivity because he too, makes a profit show casing animals that live in the wild. Of course he didn't say this. But he demeaned Michell and many, including myself, think he is wrong to use wild animals for "entertainment and profit." And speaking of profit, Sanjay failed to point out that we have less family practioners because specialists, like himself, make MORE money....but he's forgiven. Thanks for the downloads and do we know who that "huge" person is standing next to AC in one of the photos? Hope AC is better when he returns. He needs to start having "fun" with his show like Sanjay and John King. I must be one of the few Gay guys in America that does not watch American Idol. I will never understand that shows appeal. I remember seeing that interview with Simon when it originally aired, I thought it was a good interview. Not a Simon fan, but I respect the man's business sense. @judy: Was it really necessary to call that man huge?? I'm sure he knows he is a big guy, I really doubt he would need to hear that, or to see it. And you know that's a fan, I think you just wanted to get a cheap shot in on him. Not cool. 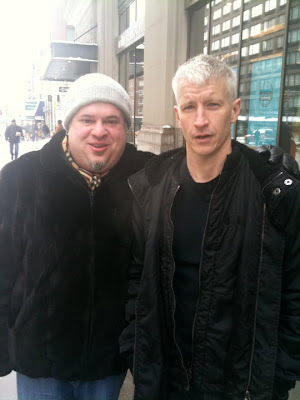 Does anyone know when that picture of Anderson was taken with that man? 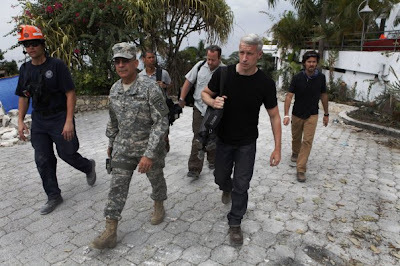 The reason I ask he looks like he doesn't feel well so I am wondering if it was after he came back from Haiti. If so I hope he is feeling better. American idol won't be the same without SC. He has sharp business acument and brutally honest - excatly the medicine much needed to cure America's "political correctness". I totally agree with ACAnderFan on all counts. The 60 Minutes piece is always great to revisit and I enjoy laughing at Simon along with AC. Also, I hope Anderson gets back his strength. He indeed looked weak and ill-almost like someone who has the flu. This is one of the VERY few pictures of him that is not flattering. @VeganCore: Obseity is not at all healthy and I think you are a bit too sensitive for some reason. I'm sorry I didn't mean huge, I meant nutritionally challenged and I DIDN'T know it was a fan or I wouldn't have asked. I feel horriable for saying this and my comment will probbaly not be posted because of what I'm about to say but I'm going to say it anyways. Anderson looks 100% horrable in that picture with that fan. He looks like he is coming off of something or he got into some bad stuff. Poor Anderson, I love anderson and hope he gets better soon. I don't even want to know how he feels. @judy: It has nothing to do with one being sensitive, its more of a respect thing. You could of asked if anyone knew who that man was, you didn't need to refer to him as that huge person. We can see that he's a bigger guy, you didn't need to throw that out there. It just comes off ignorant. I mean, you'd have to see that as well, if you stop and thought about it for a minute. That picture with that fan is definitely not at TWC, so perhaps not from this past Tuesday that was twittered about. Wonder when it was taken. @ Judy: after reading your comments here for several months, I have to say, I find you to be just a downright mean spirited person. Must be nice to be perfect. I'd hate to be a student in one of your classes. The "huge" comment is totally out of line. It's none of our business what he is or isn't. I've been reading ATA for many years now and I'm saddened to think they would let this comment slip by (sorry ladies, I have great respect for what you do.) But what if this person is a fan who reads this board? What if your picture was posted and someone called you ugly? There's just no need for comments like that here. And no, I'm not politically correct, but this crosses the line. Do you allow that kind of talk in your classroom? @everyone, While I have to admit I cringed a bit when I read Judy's initial comment about the 'huge' guy. I posted it because I appreciate Judy taking the time everyday to comment. Most days fewer than 1% of our readers bother to give us their take on things. Some because they are shy, some because they lack confidence in their opinions and I'm sure some because they use ATA for information but would never admit it because they picture themselves as too sophisticated to comment at a fan blog. While Judy and I seldom agree she does keep things interesting and I appreciate that. But please don't judge her or me or anyone by a few brief words that you read on the internet. We are so much more than that, as are you. 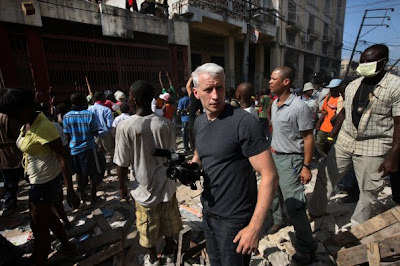 I'd like to add one more thing about getting your picture taken beside Anderson Cooper. He is so tiny that he would make even the most svelte of you large. The guy pictured with AC looks so happy and isn’t that the important thing? Phebe, I totally agree. The fan looks like he just won the million dollar prize. May we all be so lucky one day to get our picture taken with AC. I've also heard that AC is very accomodating when he is asked to have a picture taken...how refreshing in our time of celebrities who will not sign an autograph or pose for a pic. TO ALL OF YOU: I have total confidence in my opinions and I think if you post anonymously you do not have confidence in yourself and I stand by my comment on obesity. I hope Phebe posts this since she allowed others to voice their opinions about my posts which generally speak about the NEWS. Others often just say what they think is appropriate. I say what I feel and I thank Phebe for the opportunity. @10:08AM: In answer to your question I would discuss obesity, just as Michelle Obama is discussing it....and if this is a fan, I personally would have refrained from having my photo taken and YOU should not post anonymously and then "pick" on others. Sanjay did NOT do a good job in interviewing Rector and Hanna about the seaworld killing. He censored Rector during the interview by telling him not to go into deatails about the orca killing!